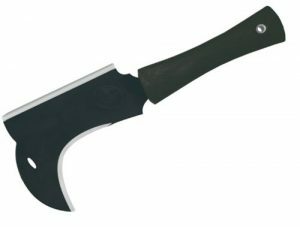 First things first, we have to clear up what we’re talking about with a “brush axe” or a “bill hook”. 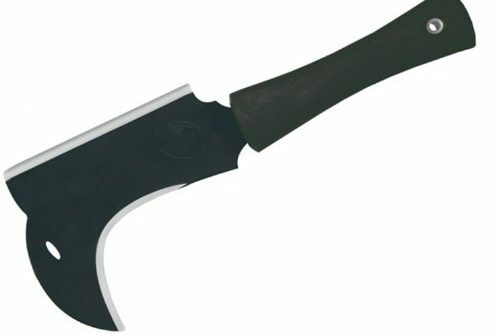 A brush axe is the same product as a bill hook. There, that was easy. Below I’ll go over a few that I’ve tested and which I recommend. The bill hook is used a lot by homesteaders and those in agriculture for cutting smaller woody material such as branches and shrubs. 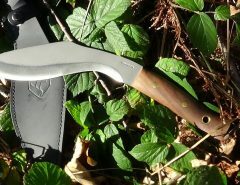 The billhook machete traces its origins back to ancient times. It was used for cutting around objects such as grape vines, branches and shrubs. The first half of this article will go over the history of the billhook and how it’s used. The second half will go over some billhooks that I recommend. If you’re just looking for a brush axe to buy, check out the best brush axes available on the market. 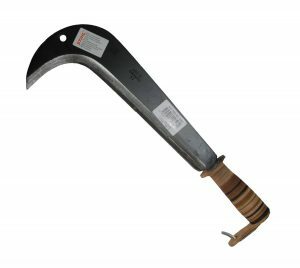 A billhook is a cutting tool that has been mainly used in forestry and agriculture by cutting down small woody materials like branches and shrubs and it is very different from a sickle. In wine growing countries like Europe, the billhook is quite common. In other countries such as China, Japan, and India, it is created locally but was introduced by European settlers in North and South America, Australia, and South Africa. Sharpening a Billhook isn’t any more difficult than any other type of bladed object but it does need a cylindrical file or stone. Billhooks are traditional cutting tools that have been used mainly in forestry and agriculture for cutting small wood materials like branches and shrubs and it looks different from a sickle. It is normal for places that grow wine fruits to use these tools for harvest. Normally the blade is made from carbon steel in different lengths and weights. Blade is straight near the handle but then have strong curve at the end of the blade. The blade is just sharpened on the inside of this curve, but broom hooks or double edged billhooks will have a straight cutting edge on the back. The blade is normally attached to a wooden handle and the handle is normally made from ash as it is quite strong and has the ability to really deal with repeated impacts. The handles can range up to 6 inches long and may be round or elliptical. The longer handles could be used for a heavier pattern such as making the tool double handed. The handle and blade normally have a tang that is passed through the handle, but there are times that a socket will enclose the blade. Sometimes there will be a billhook that will have hardwood or a horn fitted to the handle. Using a bill hook is similar to using a knife as an axe. It is often used for cutting up wooded areas that have small branches and plants like saplings. It is also used for snedding which is where you strip the shoots from the branch or hedging. It is also used to prune grapes. A billhook is an equivalent to kukris, machetes, parangs, etc. in Europe. This tool has been around since the Bronze Age and the Iron Age. There are some billhooks that will have just a single beveled blade that you can get for both right and left hands, then you have dished blades or ones that have a thickened nose. Most of these variations have been lost in time. The use of the Billhook goes all the way back into the Bronze Age, and there are even a few that have been found and dated that have been found in the sea around Greece. 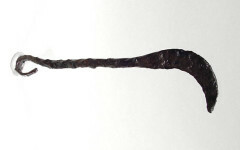 Billhooks from earlier times have even been found in pre-Roman settlements in many English countries and even in places like Switzerland where it is a called a Gertel or Germany where it’s called the Sechsle or Hippe. You can use this type of tool for cutting animal bones or even wood. Now days, the billhook is used by charcoal burners, hurdle makers, thatchers, and even hedge-layers. The Billhook is a well known tool that has a lot of uses. You can basically use it for just about anything and be able to get the job done right. There are plenty of billhooks out there but these are the best. Ladies and gentlemen. We have a winner, this is the billhook you want. Even though it’s called a “bush knife”, it’s really a bill hook. It’s made by Condor Tool and Knives who are renowned for their great quality. The axe portion is a nice addition but I absolutely wouldn’t be using it for extended periods of time. If you need to use the axe portion a lot, use a camping axe. Think of the axe feature as a bit of a bonus on the odd occasion when you have to use it. It comes sharp, I’ve used it a lot and it maintains its edge really well which is the sign of a great product. All in all, you can’t go wrong with this product. This billhook is very versatile. It can be used as a cleaver, axe, hatchet, or knife. The hooked edge that comes sharpened can be used as a scythe or brush hook for cutting a lot of materials that are around your campsite. It is also a pretty effective weapon against wild animals and more. The blade can cut in both directions. So if you swing it up, down, left or right it will do what you want it to. The first thing that you will notice is that the blade is done in ultra-black. It is polished to a sheen that you can almost see yourself in. The handle is made from high impact polypropylene, so needless to say it is very well fitted and works well in all hand sizes. The blade is around 8 inches long and the sheath is made from hand crafted welted leather. So, you won’t have to worry about cutting yourself if it is its sheath. The best part is that it is less than 2 pounds. So you can carry it about anywhere that you need to go. The blade is around 3.6 mm thick and has a 15-inch overall length. That isn’t too bad for a billhook. It is bigger than the ones that I am used to. 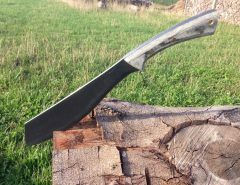 The price is a bit steep but it is worth it because of the great materials that are used to create this amazing billhook. This model is super expensive but looks sensational and most importantly, performs great. Even though it’s a great tool, the Condor Tool and Knife Bill Hook performs just as well but is a lot cheaper so you’re best off going with that. Check price. Ok, I love a gimmick and I thought this would be great because it’s Fiskars. The saw is good without being great, the actual bill hook is good without being great. Maybe my expectations were too high because it was Fiskars. I just felt that the Condor Tool and Knife bill hook performed a lot better. However the Fiskars bill hook is much cheaper than the Condor Tool and Knife bill hook. Fiskars is a name that many people know from using punches and scissors in department stores. When you get this billhook, you will find that it isn’t exactly sharp, but a few minutes with the billhook, it can be. The package doesn’t state that it needs to be sharpened, so when I see a dull edge, I was skeptical that it would work. 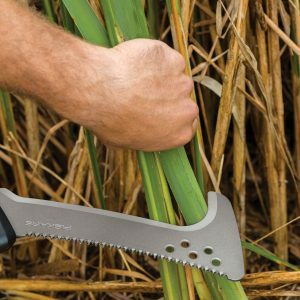 It comes with a 9-inch blade that is great for trimming stems and shoots, cutting vines, sawing branches and more in your garden. The blade curve is perfect for clearing vines so many vineyards will have this tool in their arsenal. The coarse saw edge gives you the right amount of precision for cutting woody branches and fibrous plants. Since it is a one handed saw, you can use your other hand to grab and pile your cuttings. The best part is that it comes with a lifetime warranty. The one thing that that I had an issue with was the price, it is a bit on the expensive side. But when you want a great tool, you should expect a high price. Another plus to this tool is that it is rust resistant and has a low friction coating that will help you to go through tough materials without it sticking. 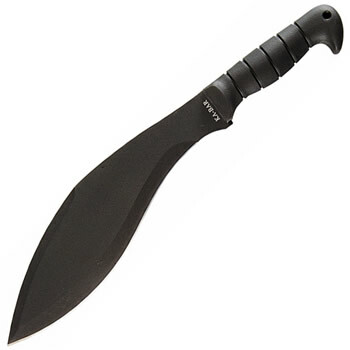 It also comes with a nylon carrying sheath that does leave a bit to improve on. If you read my site you’ll see that I love Fiskars products. They produce great quality at great prices. I’ve never been unhappy with their products. However, every product I have bought from Fiskars was made in Finland. This is made in China. I have no issue with Chinese products. Most tomahawks are made in China. The problem is that the quality of this particular product is not anywhere close to the quality of their other products. This is another great tool that is perfect for clearing brush, feeling small trees, and stripping logs. 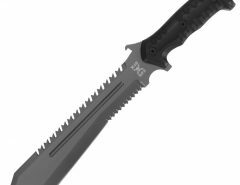 It has a hardened 9-inch steel blade that has precision ground to cut with a whole lot of less effort. It is rust resistant like other Fiskars models and it does have a low friction coating as well. The part that I like the best is the fact that is comes with a FiberComp handle that is really lightweight that helps to increase the swinging speed but it is stronger than the steel blade which is great when it comes to durability. There is also an insert molded design that helps to keep the blade from loosening up or separating from the handle. 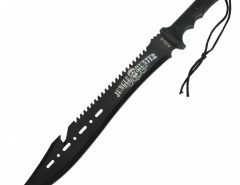 It also comes with a blade sheath that is made from nylon for safe transportation and storage. The only issue that I found is that you have to sharpen this blade as well. It is shipped in a box dull, so just a little TLC will go a long way. It is worth the money too. 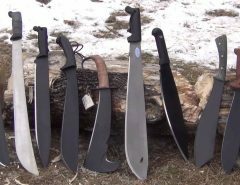 When it comes down to having a great billhook, you can’t go wrong with these four top picks. They will do what you want them to, but they all have their flaws. There are plenty of billhooks out there, but they are not made of good quality materials like these and are often quite dull and won’t work as well either.